In 2009 we formed the Benefice of five village parishes each with its own community personality, a blend of old families with strong links to the land and incomers who have settled and put down roots. Each village has its own parish church, in varying states of repair. The congregations are small and are excited by the prospect of working together, building on cordial previous connections and providing mutual support whilst maintaining their distinctive characters. In 2014 the parish of Southery joined the Group as part of on-going Deanery reorganization. The parishes of Feltwell, Hockwold, Northwold, Southery and Weeting sit at the eastern edge of the Diocese of Ely, part of the Deanery of Fincham and Feltwell. On the edge of Brecklands, these rural villages are bordered by Thetford Forest to the east and the Fens to the West. The wider region is rich historically with archaeological sites from Roman, Viking and Saxon times and is also abundant in wildlife. There are two nature reserves locally, supporting rare bird species, and the north Norfolk coast is within an hour’s drive. Thetford Forest provides abundant spots for walking and cycling and there are National Trust and English Heritage sites nearby. You can find information about the individual churches by looking in the buildings menu or follow the links on the names above. The name Grimshoe (“Grims-ho” ) comes from the old Saxon name for the larger surrounding area as listed in the Domesday Book. It was known as the Grimshoe Hundred and actually took in 19 villages. Most English counties were divided into hundreds from the late Saxon period and were, with a few exceptions, effectively abandoned as administrative divisions in the nineteenth century. 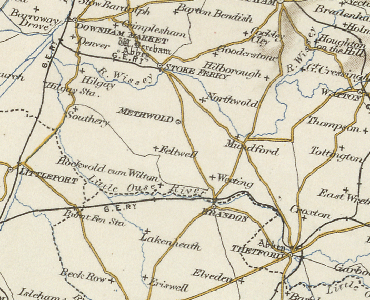 The Benefice adopted this name as it effectively encompassed the geographic area covered by the combined parish boundaries.